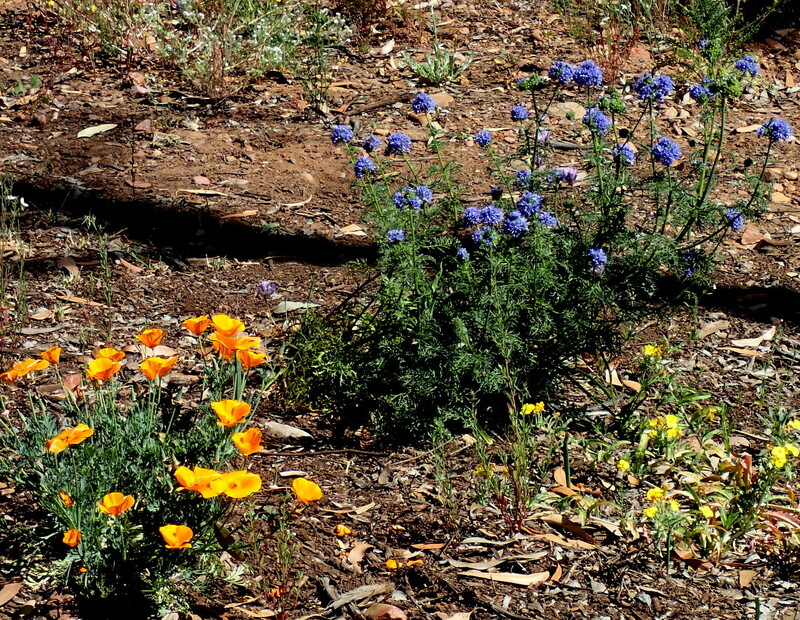 Wildflower seeds sown in June 2016 and left uncovered produced a nice bloom of wildflowers in April 2017: Eschscholzia californica (poppies), blue Gilia capatita, yellow Camissoniopsis bistorta (sun cups), and white Cryptantha intermedia (popcorn flower). Conventional wisdom says that the best time to sow annual wildflower seeds is in the fall, just before the rains, and that seeds should be covered with a thin layer of soil to protect them from predation. This conventional wisdom may be wrong. Tests in Scripps Ranch and Poway (San Diego County) suggest that it is better to sow wildflower seeds months in advance of the fall rain, and that covering seeds may actually prevent them from germinating. The first test was in my friend Bob’s back yard in Poway. I mixed packets of seeds, and he sowed them in three adjacent areas in July, September and early November. He covered half of each area with a thin layer of soil and left the other half uncovered. The worst results were in the November area covered with soil. The best were from the half of the September sowing that was left uncovered. I tried a similar test in a small Scripps Ranch open space, dubbed the “Canyonito” by CNPS member Sarah. I sowed seeds in three adjacent areas in June, September and November, leaving them uncovered. Workmen later covered the last two areas with a thick mulch to suppress weeds. No wildflowers grew in these areas at all. 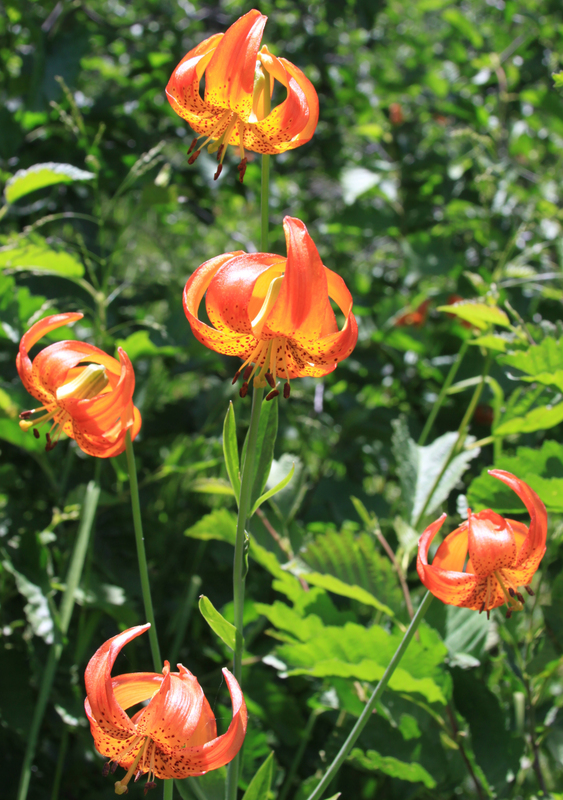 However, the area sown in June was left alone, and this area had a beautiful spring bloom. This test shows that you can get good results from sowing seeds early. In a third less formal test, I sowed wildflowers on a hillside brush management zone in Scripps Ranch in October. This is an area of trimmed chaparral with considerable bare dirt. Two of the species behaved differently here compared with how they grow in the wild. While some plants grew to a normal size, many more grew late and stunted. Plants that grow stunted like these are uncommon in the wild. It’s CNPS Fall Plant Sale Season! Fall is the right time to prepare your garden for spring! When is your local chapter hosting a plant sale, presentation, or native gardening workshop? The CNPS Horticulture Events Calendar is searchable by CNPS chapter and type of event, including “Plant Sale” to help you plan for regional CNPS Chapter plant sales. The calendar is frequently updated, so be sure to check back for events in your area, or follow the CNPS Facebook page where we are posting many of these events as well. 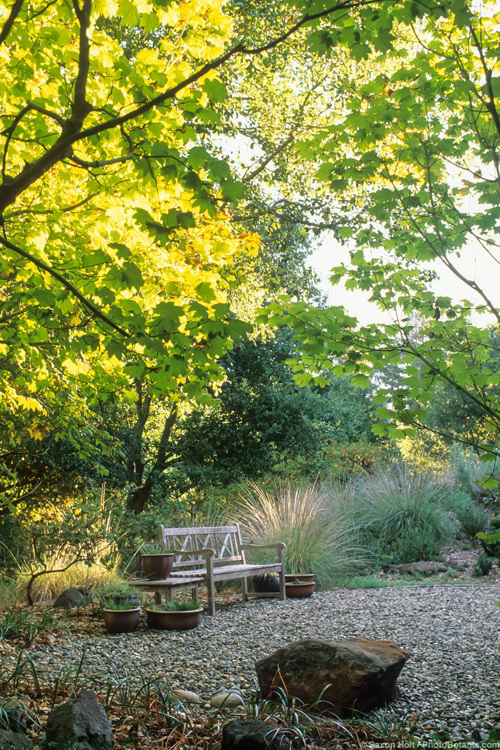 There’s never been a better time than now to transform your yard into a water-thrifty, habitat-extending, native garden! 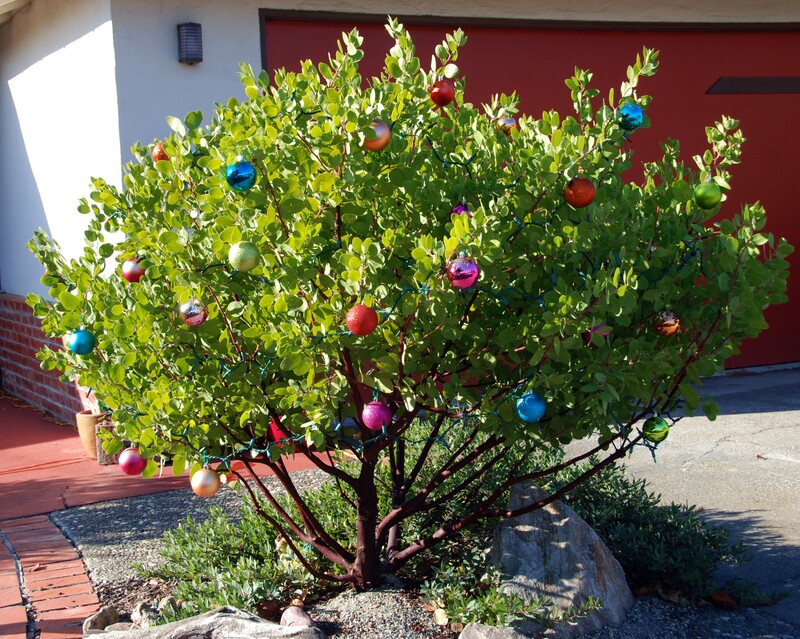 Pete Veilleux shared this picture with us of a cute little Arctostaphylos dressed for the holidays. Do any of you have other photos you’d like to share? It’s fairly warm in most parts of California and the northern end of Baja. And dry. People are talking dry dry dry…so here is a bit of refreshment. I took this photo at the Waterfront Grill in National City. The cool water and colorful surfboards reinforce the beautiful rusts and creams of this field of buckwheats. 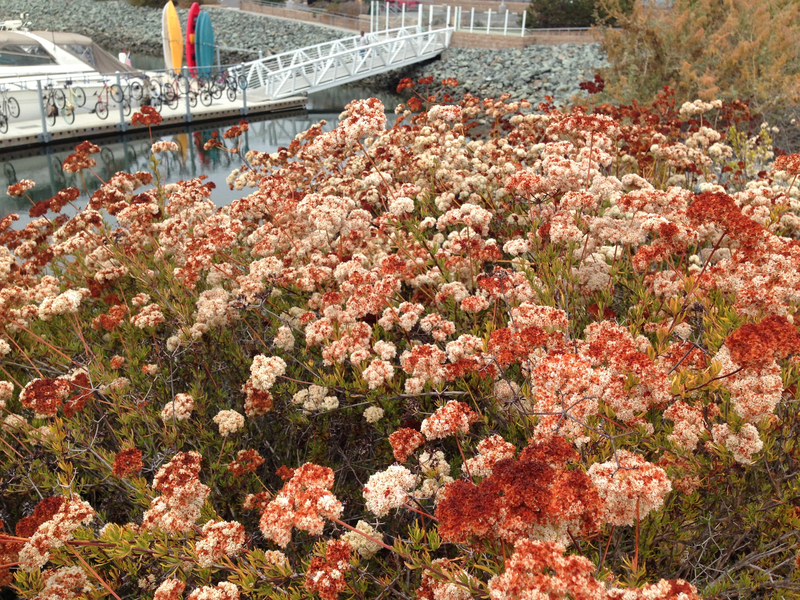 Eriogonum species always turn up on drought-tolerant plant lists everywhere. For ornamental gardening, they are usually conceived of as plants for the typical dry-looking garden. But here, they were positioned at water’s edge and they really made a hit, visually. The Eriogonum family is a pretty diverse group, with a wide cultural range. Great pollinator attractors, too. Find out what grows nearest to your location, find it at a local nursery and try one soon. Then plant more!